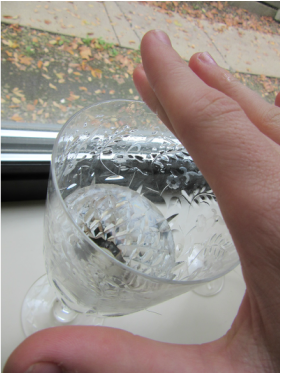 As many know from experience with their own glasses, a unique sound can be produced from running a wet finger around the rim of a glass vessel. A large number of glasses can be used to form a larger instrument known under the guise of various names, like the Angelic Organ, Musical Glasses, and most frequently, the Glass Harp. Composers and performers have taken note of the ethereal quality of glass in music for a long time, with composers such as Gluck giving performances on glass instruments. Benjamin Franklin, amazed by such performers, invented a device, named the Glass Armonica, which mounted glass bowls on a spinning wheel to make the process of producing sounds on glass much more simple. This instrument gained the attention of composers such as Mozart, Beethoven, and Hasse. ​However, because of its ethereal, otherworldly quality, the playing of glass instruments began to be associated with insanity, this can be seen by the mad scene in Donizetti's Lucia di Lammermoor, where their is an extensive solo written for Glass Armonica (many performances now use flutes instead due to their greater availability). Glass instruments have had difficulties since that time reaching public consciousness despite inclusion in popular works such as the Aquarium from the Carnival of the Animals by Saint-Saëns. However, in the last several decades there has been a renewed interest in glass instruments, with the re-emergence of manufacturers of the Glass Armonica, the invention of new glass instruments such as the Verrophone and the Crystal Baschet, and the inclusion of Glass instruments in film scores such as Big Hero 6. Jeffrey Zane Hansen has a keen interest in music played on glass instruments. As such, Jeffrey Zane performs on a Glass harp comprised of glasses he has spent several years obtaining. He has further contributed to the renaissance of glass music by composing works for glass instruments, both in solo and chamber contexts with other instruments. Click here to view some of Jeffrey's compositions.